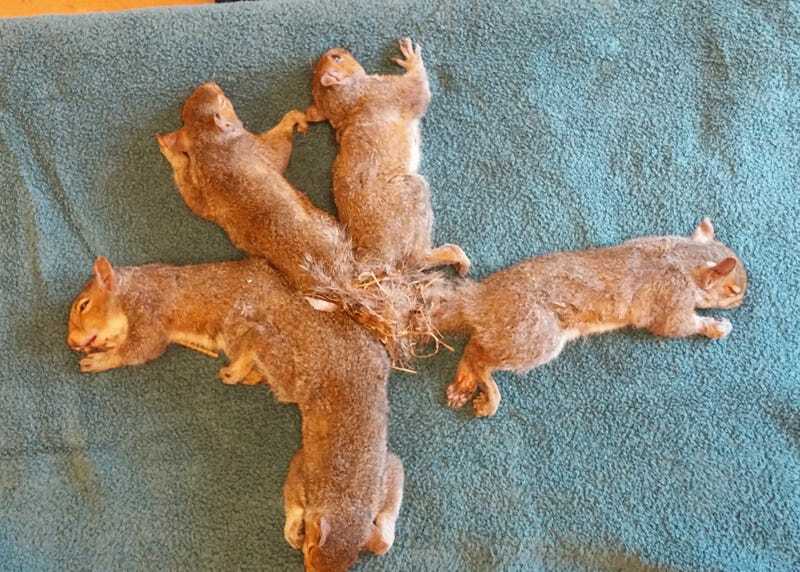 Vets at the humane society anesthetized the five squirrels so they could work on separating the critters without getting scratched or bitten up. It ultimately only took 20 minutes to free the squirrels after snipping away at the plastic and grass and shaving the hair from their tails. As weird as it sounds, squirrel-knot situations like these seem to happen fairly often. “[One of our volunteers] has seen this before, but we’ve never had five tangled like this,” said Speed. We actually reported on a similar situation in Nebraska earlier this year, even though it was with fox squirrels rather than eastern greys. It’s pretty common for plastic fibers to get tangled around animals, leading to necrosis and sometimes toe or whole-foot amputation in animals like pigeons. But this squirrel king (squirrel prince?) is fairly different from the “rat king” that may come to mind when you hear “rodents attached at the tail.” Rat kings are thought to happen when black rats swarm, tangling their hairless tails together in a real knot. The topic is shrouded in myth, although Mental Floss worked to detangle the story in this comprehensive piece.